RTS is set in an alternative version of the Stone Age, in which people share the world with dinosaurs and mythical beasts, and their survival is enabled not only by natural resources, but also by the magical artifacts left by ancient civilization. 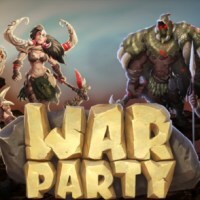 Warparty is the Real Time Strategy, which takes players on a journey to an alternative version of the Stone Age. The game was developed by independent Warcrave and Crazy Monkey Studios. Warparty tells an alternative version of the history, in which eons ago, the Earth was inhabited by a powerful civilization making use of magic and advanced technology. Centuries after its fall, the world has been conquered by dinosaurs and mythical beasts of all kinds, and human tribes have to fight for survival every day. They fight for control of limited resources and ancient artifacts that they believe will give them control over the entire world. In Warparty, the action is shown from the top-down perspective. During the game, players take control of various tribes, each with unique units, buildings, and combat skills. Players are tasked with acquiring raw materials, erecting various buildings, as well as recruiting soldiers and sending them to fight againstenemy tribes as well as the aforementioned beasts and dinosaurs who stand in their way. Interestingly enough, the latter can be eliminated or subjugated, making them mounts for one's subordinates. The game is enriched by powerful powers, thanks to which players can, for example, send hail, lightening, and even meteorites down on theri enemies. Warparty streamlines both solo and multiplayer gameplay. For those, who enjoy solo experience, there is an extensive story campaign, survival mode, and battles against the AI-controlled opponents. Multiplayer fans can compete with each other over the Internet (which is encouraged by the presence of rankings, where players can boast of their achievements). Warparty delivers colorful and eye-catching 3D visuals.